I watched a lot (far too much really) of the Channel 4 programme 'Top 100 Tear Jerkers' some time back. As with most of these things, the contemporary movies won out over the oldies in a rather unfair sort of a way. It was interesting, however, that the top two movies were, at Two, 'The Green Mile' and, at One, 'ET' - both of which are, in my opinion, fairly accurate mirrors of the New Testament story. In 'The Green Mile' - Tom Hanks is effectively the centurion at the foot of the cross who sees and believes although he still lets the good guy die. And as for 'ET' - well, where to start? An other-worldly visitor arrives, does miracles, spreads love, assembles a following, is killed, rises again and then ascends into heaven. So, do you want to know where to borrow a good tear-jerker story? 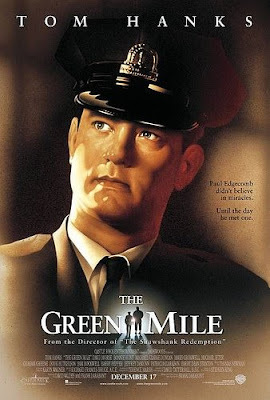 I was pleasantly surprised by "The Green Mile" which I figured would be Stephen King gore + prison. Interesting analogy...don't think it would've occurred to me. But that's why I visit here... to stretch the braincells. ;) Thanks! I've seen E.T. so many times and not once have I thought to make that connection. Huh. It does make sense, but coming from a Jewish director, I have to wonder. As for The Green Mile, I haven't seen it. If that's true, then Tom Hanks has recently done a complete about face with his roles. The last movie that made me cry was the remake of The Incredible Journey. I'll admit, I cry at anything--I think only Bob the Builder is safe from my tears at this stage in my life. Thanks for mentioning the Top 100 programme--I always enjoyed those for some reason when we had TV, perhaps for the insights and commentary of the presenters. But I found the same thing: whatever was most recently plonked into the national mindset often took over the top few slots. I love the Green Mile! I totally believe there are empaths in this world and that they are often persecuted and killed because people are afraid of their abilities and gifts. ET is a perennial favorite at our house, too, so great choices, Ken. Ghost is probably my husband's all-time favorite -- it has a song he adores, Demi Moore and a theme he totally relates to. And what about that classic British tearjerker (at least it was for me the first time I saw it as a young kid), Whistle Down the Wind, where a young girl mistakenly thinks that an escaped prisoner hiding in her father's barn is the resurrected Jesus Christ? Kat: I'm not saying the notion wad deliberate - although with ET it's hard to avoid comparisons once you're over the first hurdle. You should see Green Mile really, it's a good story. Jim: Whistle Down the Wind marked the first time I ever saw a theatrical trailer for a film on TV. I liked it very much, though now I find the music as little intrusive. "Are you Gentle Jesus? Neither are my favorite tear jerkers and ET doesn't hold the magic for me that it did when I was a kid. "Brian's Song" was actually a 1971 movie on television. It was the story of two Chicago Bears football players [our football, not yours] Brian Piccolo and Gayle Sayers. Before anyone did "Disease of the Week" movies, it was very moving because Piccolo has cancer...and you can imagine the rest. It was "unique" at that time because Piccolo was white and Sayers was black. It moved me so much as a kid that I read Gayle Sayers autobiography "I Am Third". It came from a saying he liked, "God is first, my friends/family are second and I am third." Like it so much Mom had those three words engraved on a gold medallion for me for Christmas that year. I don't know, Ken, I have a very strong urge to defend Malcom Arnold's music to the film. I think it ranks with his best 'classical' work. Maybe you need to listen to it again? Just dropped by and can't believe no one's mentioned "Kes". Still the film that moves me the most; there is no Resurrection in it for the kestrel and no salvation for Billy. Hmmm... no word in a few days. Are you watching Star Trek?? (Like I wish I was?) We're going next week I hope--no spoilers! I was also thrilled to see The Green Mile, I love this film! Jim: Thanks for that, I listened and enjoyed. I think my perception of the music in the film was that it was overused and recurred as a theme too often. I feel this about the Simon and Garfunkel songs in The Graduate too, good but they pop up too regularly in the film. Also, I wonder if that youtube extract is actually from the original soundtrack, it sounds a little more 'produced' that the movie music I remember - it's been *such* a long time though. Titus: You have encouraged my to see Kes again - next time it pops up I shall close the curtains and indulge. Glynis: A crafty marketer indeed! I went alone to the movies to see the Green Mile (as I often used to so) I enjoyed it a lot although it is a tad over-long, I think. I bawled all the way through, "Being There". I know. It's a comedy, of sorts. What can I tell ya? There was another tear-jerker on 1970s t.v. about a guy with cancer...what was it? The actor was John Savage, I think. Wait, I think it was called "Eric". It was a killer tear-jerker. Mark Hamill was in it too. I cried at the movie "Awakenings" with Robin Williams. Went through a box of tissue on that one.